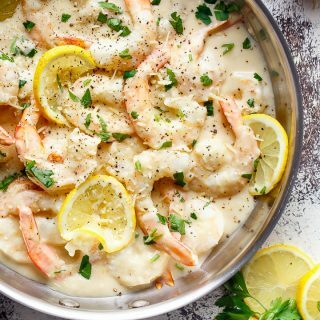 Creamy Lemon Parmesan Shrimp is a gourmet meal! Only minutes to make and full of lemon parmesan flavours with a good kick of garlic and the option of NO HEAVY CREAM! 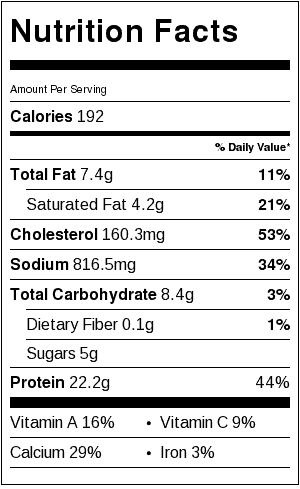 Only 7 grams of fat per serve! A restaurant quality dinner made at home for 1/4 of the price and way less fat than a gourmet kitchen! Out of all the sauces in the world, why are creamy sauces just so much better? WHY when our hips (thighs?) and the rest of us want to cringe when we order them at a restaurant, only our brains and taste buds don’t really care at the time and we just go for it regardless…..usually with painful regret afterwards. 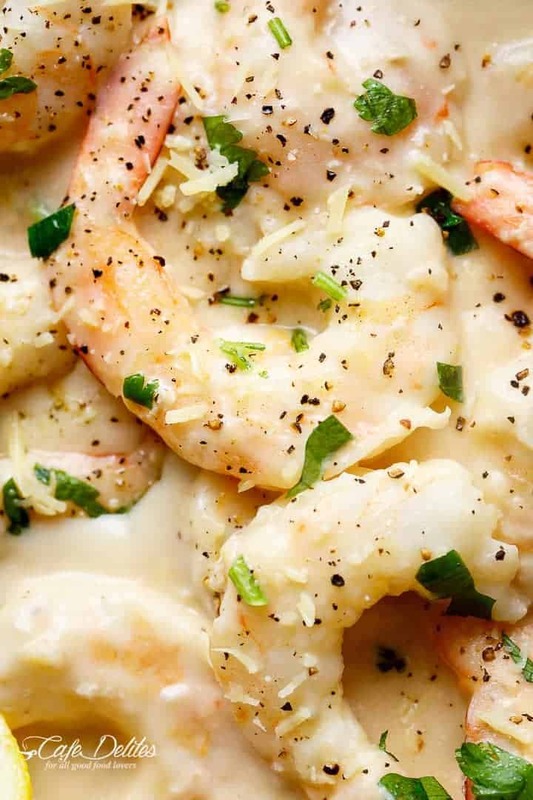 And then there’s shrimp and creamy sauce. They’re just meant to be — a match made in seafood haven. Throw in garlic, parmesan and lemon and what restaurant? Where? We don’t need one. This recipe brings out the inner chefs in our world of home cooking. First, I want to apologise. I have no progress shots for you because cooking this recipe goes by so fast I had no time! In five minutes I had a pan full of creamy shrimp and a palm to my head for not slowing down. In my defence, I was timing this recipe from start to finish, to report back to YOU that this took me 5 minutes to have on the table, from start to finish. If you (like me) have been eating out a lot lately and avoiding supermarkets like the plague (because it’s too cold / hot wherever you are in the world….you know who you are), I’m talking to you. No more giving your money away to other people to cook your food, only to walk away with semi-satisfied taste buds and wishful thinking of what it SHOULD have tasted like. More garlic. More flavour. Was it worth the empty wallet? Ummmmm. No. 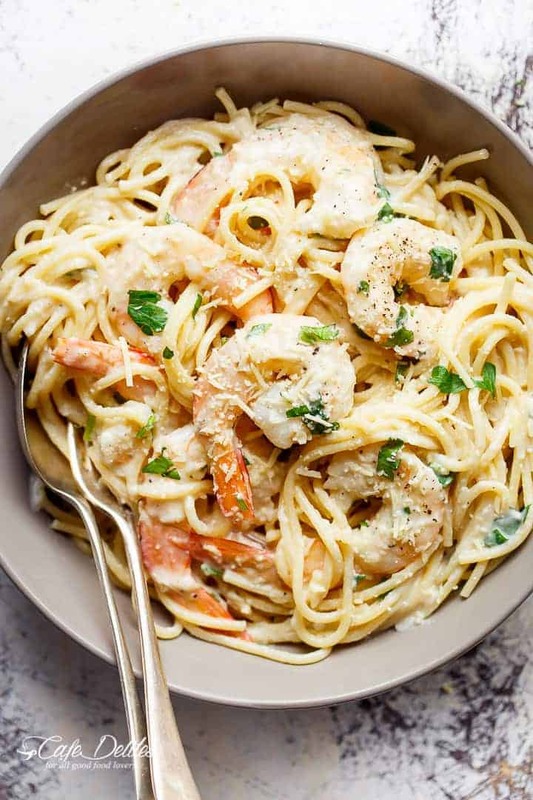 Because you are going to serve this with a big bowl of rice, pasta, zucchini noodles, cauli rice, or even vegetables, with the satisfaction you made this yourself, with fresh ingredients, a lot of love, and the new title of creamy shrimp hero. Share it. Don’t share it. Whatevs. I’m not judging you. 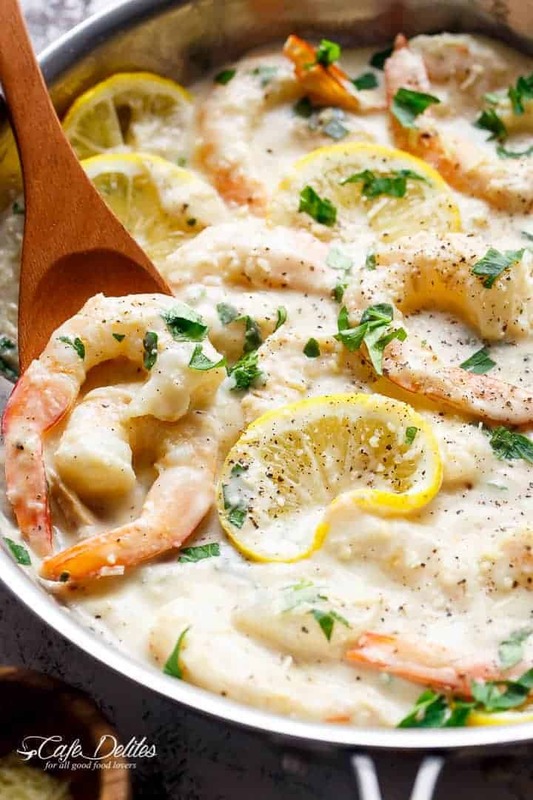 Adapted from Creamy Lemon Parmesan Chicken (Piccata) and Browned Butter Shrimp Scampi! 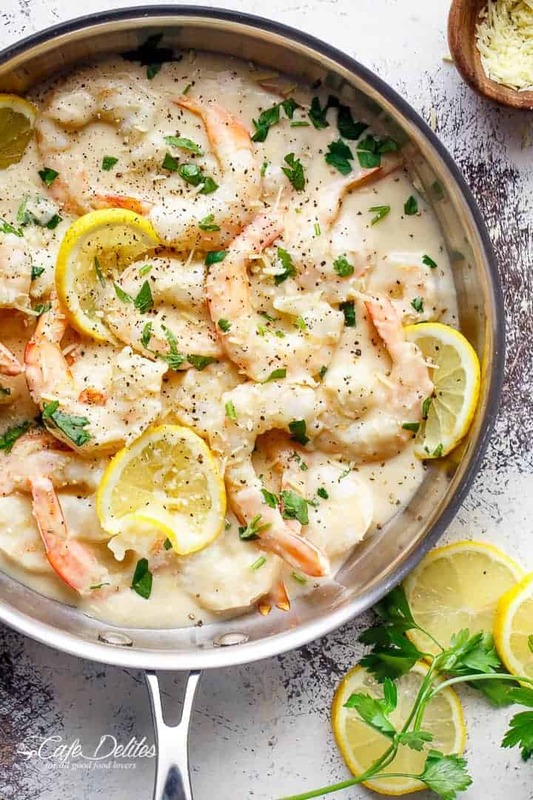 Creamy Lemon Parmesan Shrimp is a restaurant quality gourmet meal! Only minutes to make and full of lemon parmesan flavours with a good kick of garlic and NO HEAVY CREAMS as an option! Plus no dairy options! Weight Watchers Smart Points: 5 per serve! Heat the butter (or oil) in a large skillet over medium-high heat until butter has melted and pan is hot. Fry the shrimp (prawns) for 2 minutes each side until pink and 'just' cooked. Transfer to a plate. Add the garlic to the remaining butter (or oil) in the pan and fry until fragrant (about 1 minute). Reduce heat to low-medium heat, add the milk (or cream). Bring the sauce to a boil; season with salt and pepper to your taste; add in the parmesan cheese and and allow sauce to simmer for about 2 minutes until thicker. Add the cornstarch/water mixture into the centre of the pan and whisk through fast to combine into the sauce. It will begin to thicken immediately. Take off heat and stir in the lemon juice. Add the shrimp (prawns) back into the pan; top with lemon slices, parsley, extra parmesan cheese, cracked pepper and salt (if needed), to serve. Serve over steamed vegetables, zucchini noodles, rice or cooked pasta. *For a no dairy option, almond milk or coconut milk or may be used. Just be aware the sauce will take on the flavour of the milk you choose! Easy, flavorful and FRESH. The sauce was incredible!! I plan to use this sauce in other recipes. Truly, appreciate your sharing this dish! This is a really good recipe! Vey quick, easy, and painless! I had no desire to cook dinner, so when I read “no time for pictures , only 5 minutes to cook”…Great, I’m in. So glad because this is very easy and full of flavor! Winner Winner! Hi Karina, thank you for the recipe. Made it last week with full cream milk and frozen shrimp. The 2 of us finished it all up with no leftovers. This was easy to follow and I got dinner on the table really fast. Thank you. That is great to hear! Thank you so much for sharing! I am so glad that you both enjoyed it! Tried this recipe tonight. Substituted milk with a can of coconut milk. It was delicious. What would you say is a serving size? My boyfriend and I want to try this but have a tendency of going overboard with delicious meals ? Crissy! About 6-8 shrimp, depending on the size you’ve bought. And about 3/4 cup of sauce; off the top of my head! It’s so delicious though! I understand the overboard issue haha! Karina, Thanks for a wonderful dish. I made it tonight. So fast. So easy. So delicious. Wow this looks drool-worthy! I tried your sun-dried tomato chicken from a few weeks ago and it was delicious so I reckon I’ll be trying this recipe out soon too, love the idea of replacing the heavy cream or cheese with cornstarch!